Vermont law bans food scraps from the landfill by July 1, 2020. 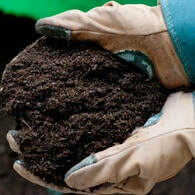 There are a variety of ways to keep your food scraps out of the trash, but composting is one of the least expensive and most rewarding, especially if you will use it as a soil ammendment for your lawn or garden. To get started quickly, you can purchase a pre-made Soil Saver compost bin, or Green Cone in-ground digester from CVSWMD at-cost. It's also inexpensive to build your own system. Check out our tips, guides and DIY bin plans below for ideas for how to get started. Never composted before? Download our Dirt on Composting booklet to get started, or join us at one of our free compost workshops. Check out this Simple 2-Bin Compost System how-to video CVSWMD designed and built, (pdf printable plans below).